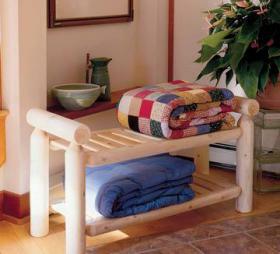 The charming and versatile quilt bench is equally attractive whether striking a great first impression in a foyer or serving a functional need at the foot of a bed. Naturally resistant to insects, this handsome cedar piece is perfect for storing wool blankets and linens. It’s also a good spot to have a seat and slip your shoes on or off.